Hello Fringe Fandom and welcome back for another recap of the world's craziest and most fantastic show! This season has certainly gone in paths that we never could have expected, and last week's cliffhanger was one of the most random AND inspired moments leading to this fabulous episode. Anna Torv has now taken on a 3rd character and she did it phenomenally. Seeing Walter and Bellie at work was just as hysterical as I had hoped for. I'm looking forward to some more of that! The case this week tied into the current theme of the show with the investigation into the soul. By the end of the episode, we learned that it also had hints of some LOST themes as well as The Adjustment Bureau (fantastic film if you haven't seen it yet). So yes, Fringe has now taken a leap into religion as its predecessors have, but it did it from a scientific point of view. And the result was "magnetically" enthralling! (Look at me trying to get all fancy with my words) Not much else to do but to get into the recapping so let's do it! Obviously, while this case was going on, there was lots of ongoing dialogue about William Bell inhabiting Olivia's body and the investigation on how to get him out of it and sustaining his energy somewhere else. We'll get to that in due time. But let's hit up the case first as always! Dana Gray has had one crazy life for the past 18 months. 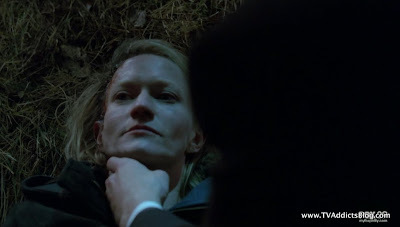 (Guest star Paula Malcomson who has pretty much been in everything these days: Deadwood, Caprica, LOST, The Event, Sons of Anarchy - though I haven't watched it yet) She and her husband and children were murdered in a home invasion robbery. But for some strange reason (welcome to Fringe), the woman who was shot 2 times in the head disappeared from the morgue. Since then she has been spotted/identified jumping off buildings with people who are already lost causes and prepared to end their lives. But her hitchhiking with suiciders, in hopes to rejoin her family keeps failing. For some reason, Dana Gray cannot die! As DeAndre Cole on SNL would say...."WHAT UP WIT THAT?!" Surprise! Lincoln Lee on OUR side has been working this case since the brutal scene of the murder. And alas, he has at long last met our Fringe team. Isn't it ironic that the one person that actually would recognize Lincoln from the other side was inhabited by William Bell? 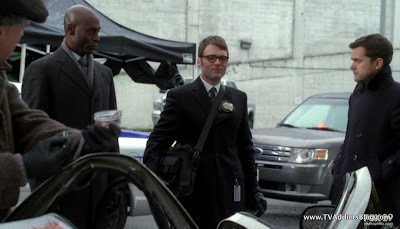 Of course, it appeared that William did recognize Lincoln even introducing himself as Agent Olivia Dunhan: Fringe Division (That's OVER THERE speak William! 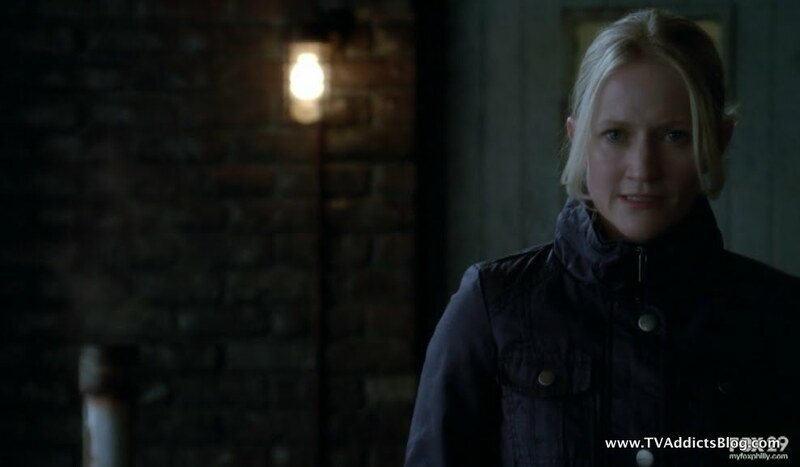 Olivia is FBI here!) It was fun to see Peter and Lincoln develop a bit of a fun working relationship while Olivia was out of commission. Lincoln was explaining the case that led him here and indicated that it would seem Dana was unable to die. William Bell chimes in "Well....stranger things have happened" Lincoln, confused said "Um...no...they haven't!" And of course Peter with the clincher "Don't listen to him...her, sorry!" Walter's pure excitement at being able to work this case with Bell was great "Isn't this our lucky day?" Walter and William have already been knee deep in the investigation. The result? 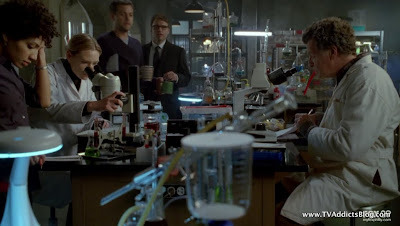 They are examining Dana's DNA that was left at the scene. Apparently, her molecules have a stronger magnetic bond (almost unbreakable) than all other humans (we learn later that Dana was struck by lightning twice which may have caused her to be "super-charged" and extra magnetic). Their first theory is that she is sucking the life force (soul) from her companion suiciders which is extending her life even further. In a bizarre way, I guess that makes sense, but doesn't explain why she survived the initial murder. But any chance to hear the term "Soul Vampire" come up, I think you have to go for it! 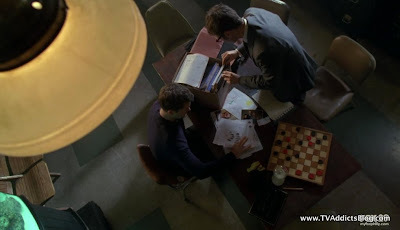 While Lincoln is very confused at the group he has stumbled upon that accept these crazy ideas without even second guessing, Peter has already taken the initiative to continue the investigation. 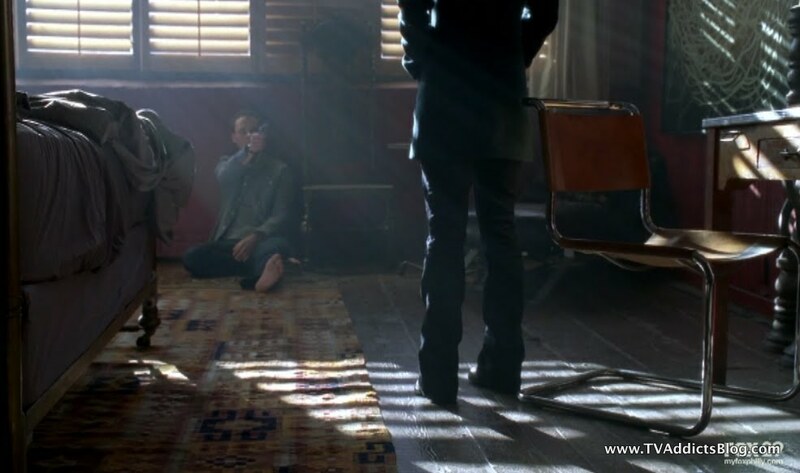 He and Lincoln decide to drop in on a suicide hotline home base and see if they can track down our Soul Vampire. It turns out to be a very telling lead. Dana does work for the suicide hotline and seems to be their best volunteer. Apparently, she has saved many more lives than ones that she has tried to use as her gateway to the afterlife. They go through her things in the office and find a book (Sesame Street Style "one of these things is different") with Religious themes. All the passages about what happens when we die are highlighted. Peter and Lincoln start connecting the dots on Dana's motive. She isn't trying to extend her life. She's trying to die. Meanwhile, Dana gets a call from another potential self-killer. She goes to see him to try and stop him (or join him if she decides he is beyond saving). The man goes into a whole speech of how he hurts people and doesn't want to hurt them. He then says how he intentionally brought Dana to him. Almost as if it was fate or part of a larger plan. He mentions that he planted a bomb on a train and provides the specific details needed to find it. Dana calls 911 and while she is dialing, he went into a biblical passage about Azriel and angels carrying his damned soul to heaven and then shot himself in the head. Dana did not try to stop him nor join him. It would seem she feels she needs to try something new. Follow some purpose or something. Did anyone else get the vibe that maybe this guy was suffering from the same "cannot die" syndrome as Dana? 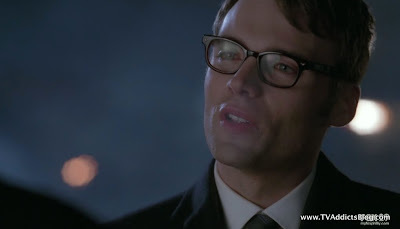 And now that he has fulfilled his mission of telling Dana HER mission, he was able to die? The only reason I say this is because Dana goes to a church to learn more about sinner Azriel's damned soul that was stuck in purgatory. The Angels begged God to end Azriel's suffering and free him, but God ignored them. The angels themselves went to purgatory and brought him to heaven. They said he suffered enough, and God decided to spare him and welcome him into heaven. Dana could certainly relate to this story, although it's unclear if she was a "SINNER" like the man who did bad things to people and planted bombs on trains. But if anything, it motivated her to try a different approach to dying. She would board this train, sit with the bomb and rejoin her family, not caring what happened to the rest of the passengers. Well, she did seem a LITTLE upset about it, but the reward of death outweighed her regret. 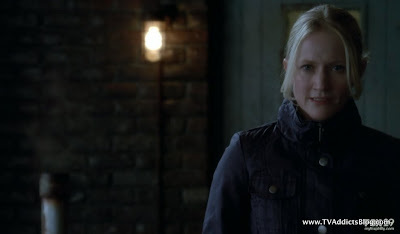 Lincoln, Peter and Broyles were one step behind Dana getting to the Azriel guy's apartment. He had some creepy secret room where he was working on all of his BAD stuff. They figure out he was working on a bomb. They also figure out (by the one bullet) that Dana did not try to kill herself so she was trying a new plan. 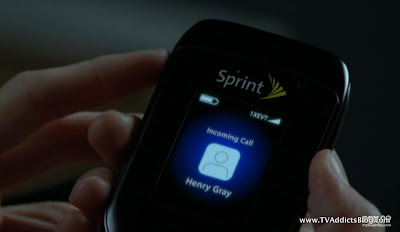 Peter, quick on his feet, finds the phone that belonged to the man and checked the caller ID. Sure enough, they find Dana's number (well, what they assume to be Dana's number). 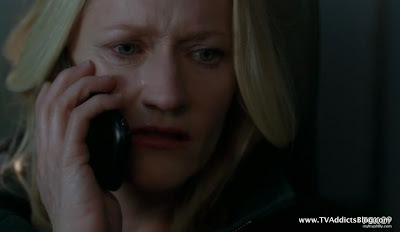 They try to call to trace her and she does not answer. No fear, the FBI apparently can change within seconds the appearance of what number the call is coming from. Dana seems to receive a call from her dead husband Henry. Peter tries to talk her off the ledge even being able to relate to her. Both of them should have died but were intervened by unexplainable phenomena. Of course, we can explain that Peter's father from another dimension crossed dimensions at the risk of causing universal destruction to bring him back to our dimension and saved his life. But it still sounds ludicrous to the average person! Dana has made up her mind and is going to go through with her plan. 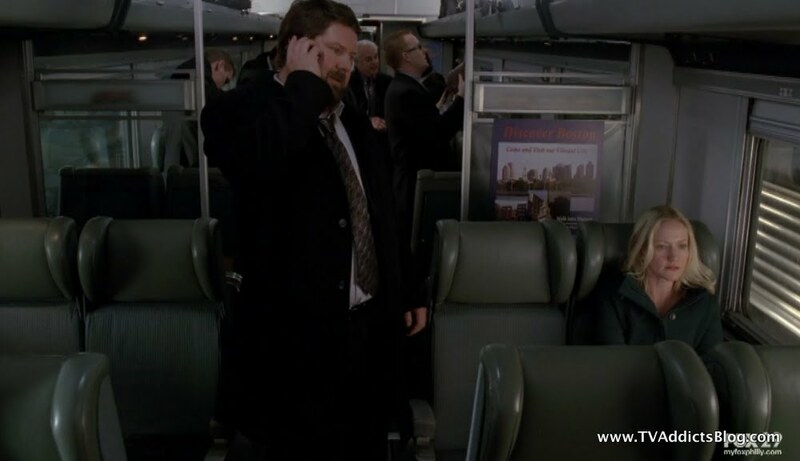 The phone call ended before they could place the trace, but Broyles was able to analyze the recording of the phone call to find some background noise indicating the train's destination. Of course, the analysts at the scene that could reroute phone numbers and such couldn't figure out a train schedule so they called Astrid to work it out for them. This conveniently led to Walter and William overhearing the conversation. There are 3 potential trains Dana could be on. William asks what time the phone call was that leads to a hysterical scene of William and Walter writing formulas on a clear board and talking in incomplete sentences. It looks like they both are using different mathematical formulas to figure out which train Dana is on but come to the same conclusion at the same time. Great stuff. The FBI rolls up and stops the train. A man on the train that was sitting across from Dana tried to assist in the investigation but she had already flown the coupe. She felt that her plans had been thwarted once again and screamed to the heavens wondering why. As she walked away from the bomb, Christian appears to Michael and said "You can go now" and the bomb blew up. Don't worry, Jin made it off the boat. OOPS!!! Wrong show... 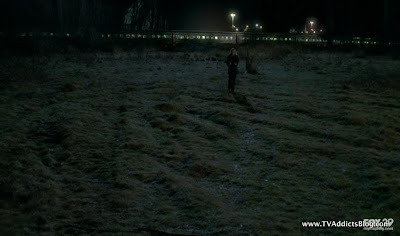 But it turned out that Paula's wish to die was granted after she removed that bomb from a train full of 300 passengers. The bomb exploded and her life ended with it. Case Closed. Lincoln questions why this time was any different than the last. Peter quoted LOST's motto by saying "every Fringe case's answer always leads to more questions." They part ways but Lincoln seemed very inspired to help out the Fringe team once again. We'll get to more of the "FATE" side of things after we catch up on the whole William Bell in Olivia's body thing! Right from the start of the episode, William started explaining what was going on. Peter and Broyles did not look happy at all. Meanwhile, Walter was as giddy as a child! 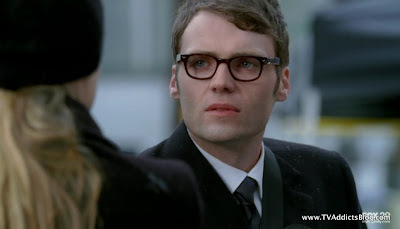 William explained that Olivia is fine and her consciousness is just resting. Apparently, William can inhabit her body for several weeks. I did find it strange that they pretty much implied he could just leave her body whenever he wants and just cease to exist. But, whatever, it's Fringe and we're already buying into this concept so we just roll with it! So, the hunt for William's next vessel begins. 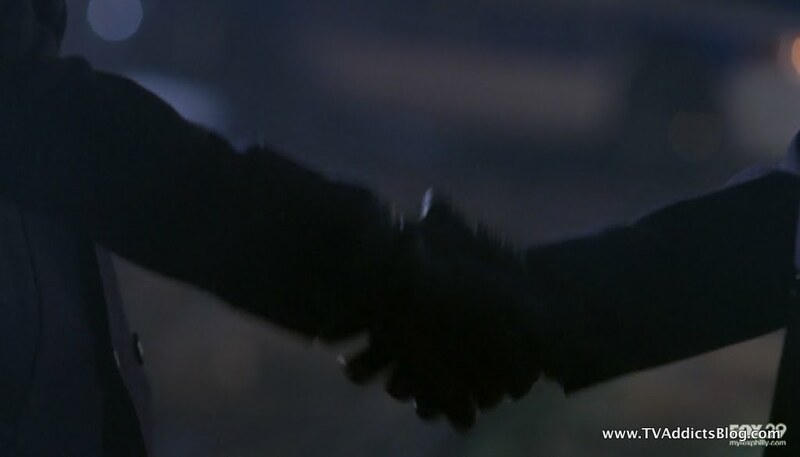 Peter and Broyles accept a 48 hour time period to find a suitor and William agrees to this. Here is some stuff we found out during the episode. 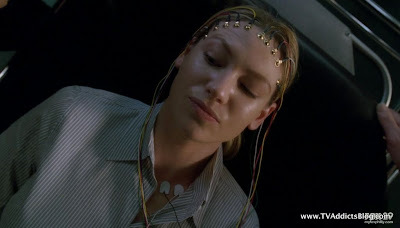 Want to know when the soul magnets were planted in Olivia? "Several Months" ago when he first met Olivia in his office in the Alterna-World Trade Center. He put the magnets in the cup of tea that she had. I'll have to go back and watch that season 2 "flashback" episode where we saw their conversation OVER THERE and see if she indeed drank tea. I'm sure she did! But SEVERAL MONTHS? Are we to believe that all of the events since the end of season 1 until now have happened within SEVERAL MONTHS? Yeah, I guess several months could be up to 11 without him having to say "LAST YEAR" but still! 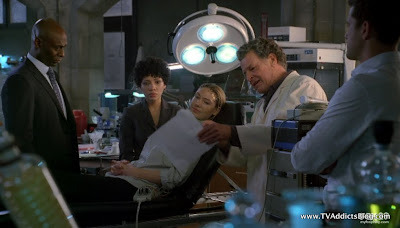 I think we established in the Subject 13 episode, that Fringe doesn't really care about keeping any kind of EXACT timeline as long as they're in the right ballpark. Peter, returned with the re-entry files. William said that he would prefer a brain dead human to inhabit, but it doesn't necessarily have to be human. 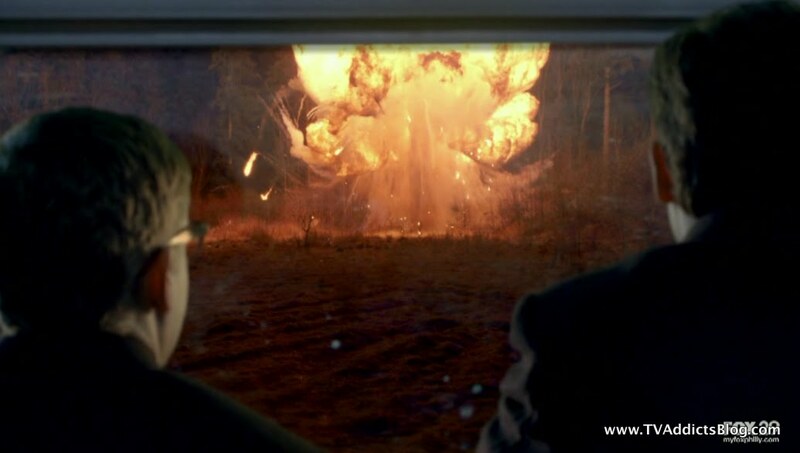 He gets sidetracked when he sees the drawing of the DOOMSDAY Machine. 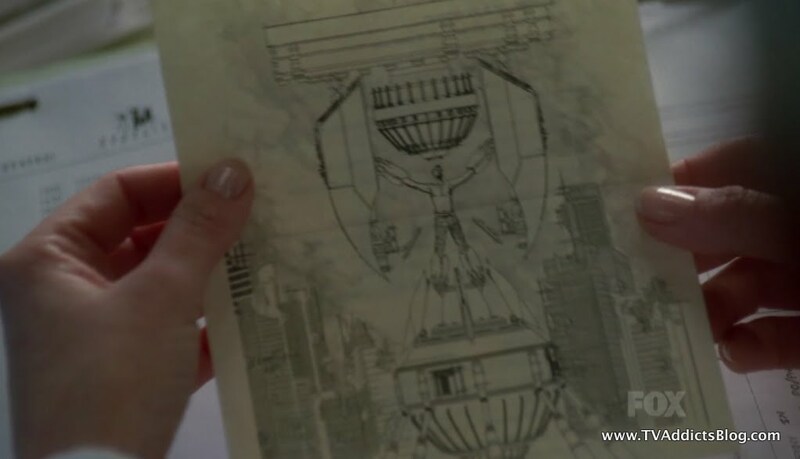 William suggests that the events in that picture could be Peter's fate, regardless of what Walter is able to find out about the machine. Of course, the whole concept of fate is strengthened by this week's case and Dana's inability to die until a certain point in time. Did we ever discuss who even drew that picture? I'm sure it was in an episode, but if I had to guess it would probably be The Observers or the First People (or maybe they're one of the same). But The Observers do know events that are going to happen, so it would make sense that they drew it. Bellie and Walter discussed that Dana's inability to die may have something to do with the location rather than her. Walter says that the universe is starting to decay, Bellie agreed that it was bound to happen. Naturally, we know now that this wasn't the issue with Dana. But, the concept is still important as it was one of the reasons Walter wanted Bellie back. To prevent the destruction of the universe. 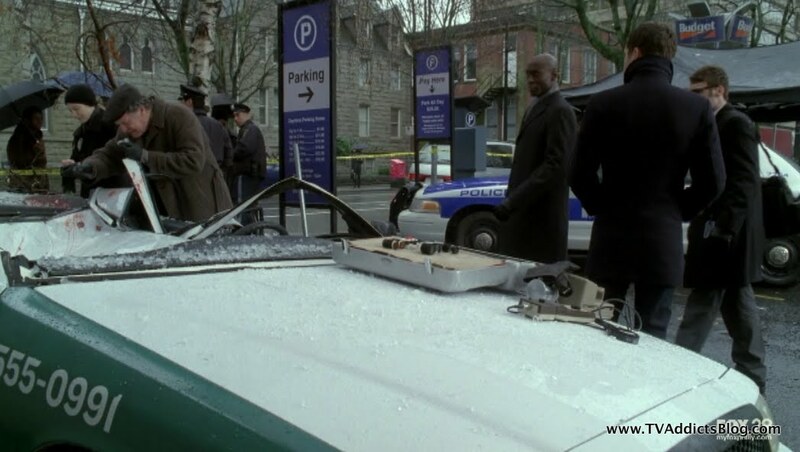 Of course, William Bell telling Peter that stepping in that machine might be unavoidable may be the way he helps guide people to the right path. We still don't know exactly what that machine will do. 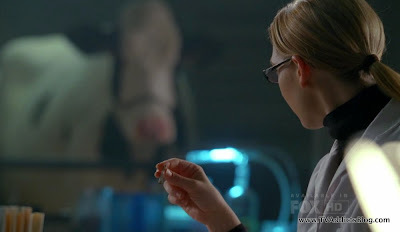 At one point, William Bell considers inhabiting Gene the cow and they could rig some device to transfer his brainwaves into some form of translatable communication. 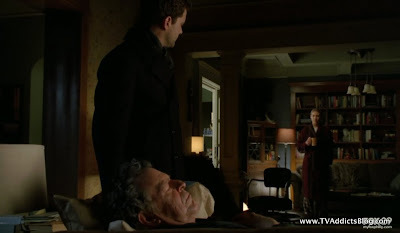 By the episode's end, we find Walter sleeping on the couch, and William (looking much like Olivia these days I must say) walking around with a cup of tea. Peter, returns home and awkwardly agrees to have a conversation with William over tea. Hmmm, don't place any soul magnets in Peter's tea, William! William and Peter discuss how maybe the energy of the bomb reset Dana's magnetism and allowed her to die. But William had a 2nd theory that it was very much tied to fate/destiny. She had to live until she was able to fulfill her destiny of saving that train of 300 passengers. He discussed that it seemed more than coincidental that they stumble across a case of a woman whose soul was forbidden to leave her body until the opportune time; at the same time Walter's consciousness re-emerges in Olivia's body. Ironically, we have been taught to learn that Science and Faith/Fate are 2 different paths (LOST ingrained that in our heads even more). But William Bell is insisting that he has to accept Fate as a result of his scientific studies. He then indicates there are signs everywhere, and instantly the church bells toll. 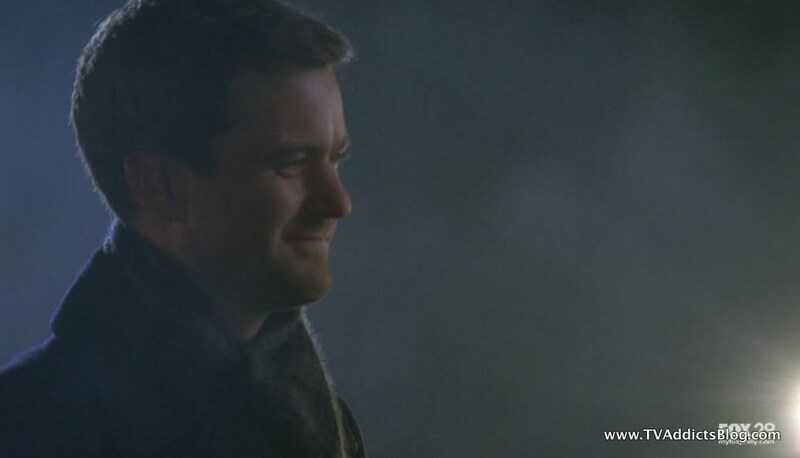 Peter, taking on the Jack Shephard role of rejecting fate, laughs at his suggestion. And, at that moment, Olivia's consciousness resurfaces and she cries out to Peter asking what is happening to her. Before Peter can grasp what is going on, William Bell returns. "Oh No...I think I may have been wrong. This may be a little more complicated than I first thought." Hmmm.....soooo HUH?? Apparently every time a bell rings to triggers the soul magnets in Olivia? Does that mean he is scared that his consciousness might not stick in a new suitor permanently? Or is he just worried that Olivia's consciousness is going to fight back and render him essentially gone? I guess I'll go with the former over the latter. 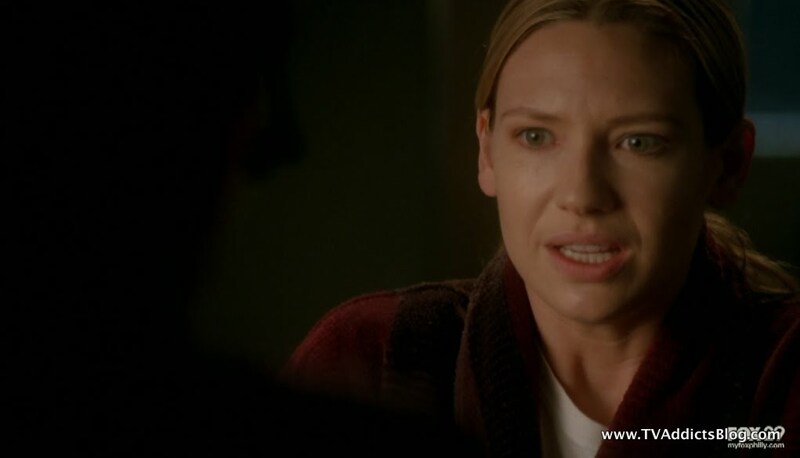 But whatever it is, it would seem that the next episode OVER HERE may see some shifts between Olivia and William providing Anna Torv with an emmy-caliber episode for her efforts. Just my guess! And that doesn't look like it will be next week as we may return OVER THERE to check in on what's going on. But enough of all of this, let's get to some fun stuff before I close the books on this episode! Observer Spotted! 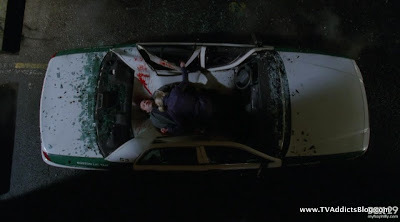 - As usual he was hanging out at the initial crime scene. I don't know how anyone spotted him, but he is way in the back of this screenshot in between the parking signs. Walterism of the Week: When discussing transferring William Bell's consciousness to Gene and connecting him to an EEG machine. "That would work, but still....I'd have to milk you!" "Bell"ism of the Week: "I understand that this could take some time for you to get used to. Imagine how I feel. I never realized that a bra was so binding!" And the laugh along with Walter's laugh sealed the deal. Runner up: Walter - "Look at this me and Bellie collecting human tissue and fluid specimens just like when we were kids!" 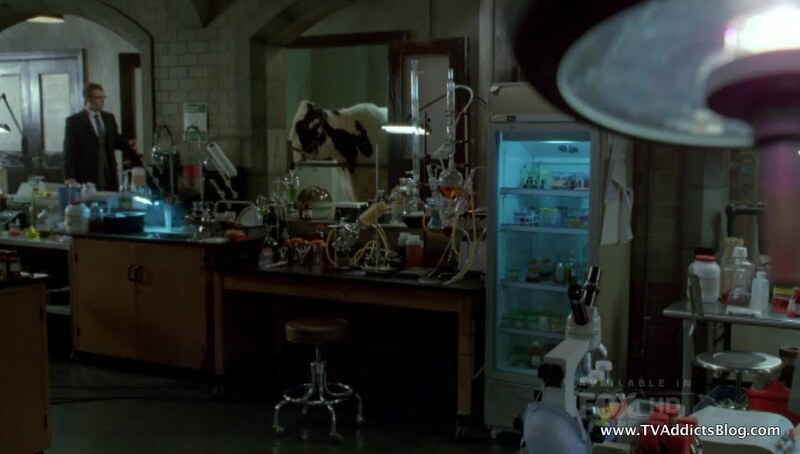 Food of the week: Licorice stuck around in the background, but Walter must have been too excited by Bell's presence to be desiring any crazy foods this week! It appears that William Bell may have a "fascination" with Astrid. First, complimenting her hands and then when explaining human magnetism, he put a bracelet on her wrist and indicated that it suited her. Astrid got a little creeped out and buttoned up her blouse. Hysterical! 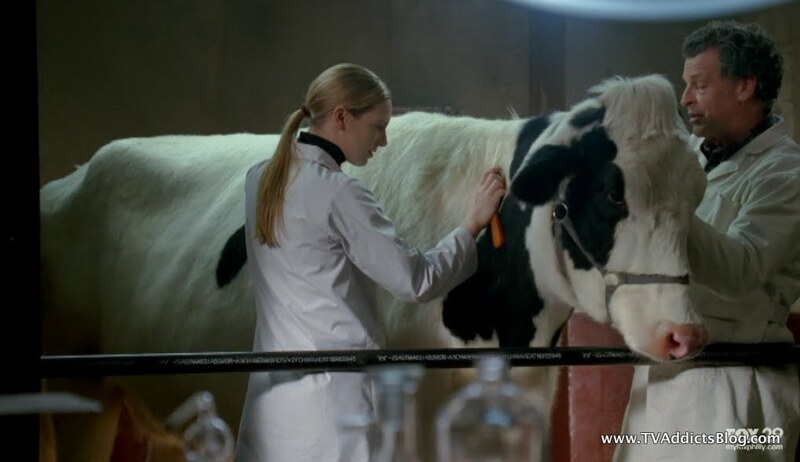 Of course, then he suggested that if he took over Gene's body that they could assign Astrid to milking him. Too Funny and Too Gross on so many levels! 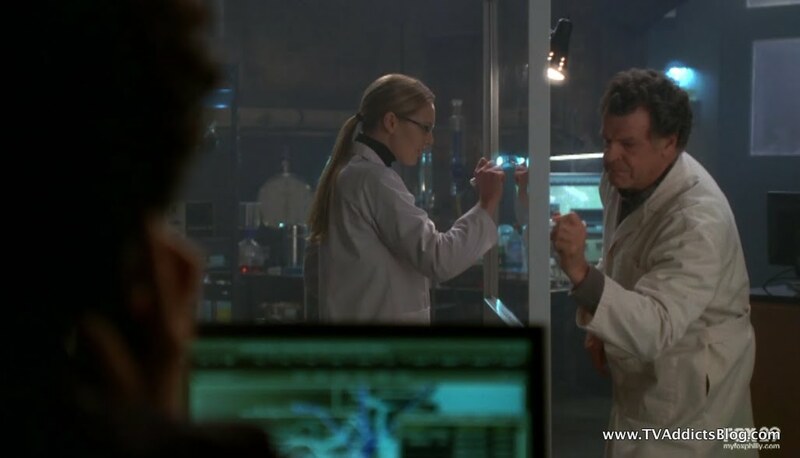 You had to love Anna Torv doing the classic "Spock eyebrow raise" during the episode to solidify her Nimoy impersonation. Fantastic. Walter and Bell discussing Bell's potential suitors while passing a joint probably indicated what they used to do back in their days of uncovering some crazy scientific possibilities. Also, very very funny as usual! I'm sure there were lots more and feel free to share them in the comments below! Loved this episode, love this season, can't wait for more! It's been my general response this entire season. Great year for Fringe. I initially had mentioned my optimism for season 4 here but just had to change it because I see the ratings have dropped yet again. It could be March Madness, it could be the weather getting nicer, it could be the fact that people can't consistently keep up with Fringe on a Friday. It could be a combination of all 3. I just hope Fox has its back. It would be a shame to let such a great show slip away. 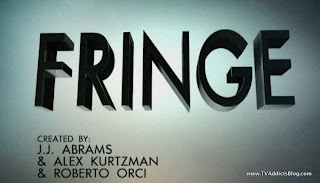 I'll go one step further and suggest that Fringe should be a candidate for the Emmy's this year. Doubtful since it's pretty strong in the Sci-Fi realm. LOST was an anomaly with it's 5 out of 6 nominations and 1 win. But we'll see! Certainly Noble and Torv have proven more than enough that they deserve nominations. And that's no slight against Pacey! (oops) He has been great too. Anyway, that's all I have for this week. I hope you enjoyed my ramblings and I'll see you (over there) next week! Thanks again, your reviews do help the show. 1. Yes, Walter did get Bellie's files form MD, I think last ep before he rang the bell. 2. One of my favorite lines was when Bellie said Astrid would have to milk him. 3. Last week I suspected that Peter would not like Bell inhabiting his girlfriend's body. We saw it here of course. That would be just too wierd that your girlfriend is now kind of a guy. Not sure I could so easily take her back once Bell left. 4. As far as the long term story arc there were at least 3 things here. A. Bell is "alive" and on this side working with Walter and Walter seems to have synergestically gone through a metamorphasis gaining cerebral abilities and confidence. B. Bell as a scientist accepts fate as real. He said the second option concerning Gray's death was more likely. This ties into what he told Peter earlier in the ep as well. I got the feeling that Bell expects Peter to wake up to the reality of fate at some point. C.Bell expects this side to deteriorate as does Walter. 5. I was not as impressed with the Olivia playing Nimoy. It kind of got silly to me. But I could definitely see where she was trying to portray some of his mannerisms. I thought of my kids running arounnd imitating scarry monsters at Halloween. 6. I was disappointed how little effort was put into finding a place for Bell, when they only have 48 hours. Makes me wonder if they're going to lose him or have to put him somewhere temporarily resulting in added risk. 7. Overall I liked this ep very well. At least Walter wasn't all whinny. 8. As you may recall I brought up comparisons to Dune before. Dune involves a lot of religion,transhumanism and technology,btw. When I saw scenes for next week it reinforced my suspicions. Since I don't want to be too spoilery, I'll refrain from repeating here. @Richard - No prob, thanks for your comments as always too! 5.) 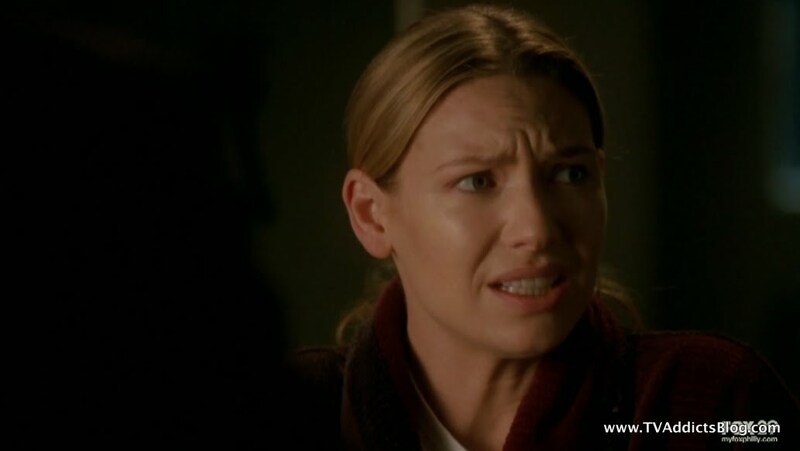 I guess there's only so much you could ask Anna Torv to do in one season. I think her Nimoy/Bell was suitable and distinguishable from Olivia and Fauxlivia. I am quite impressed with what she is doing this season. As far as it being an EXACT Nimoy impersonation? Well probably not. I'm still wondering what vessel they're going to find for Bell. I know Leonard Nimoy is returning to the show this season...but his body is vaporized so I can't see them being able to use his old body...so we still don't know if his return is in a flashback or something! lol I'm sure this is why they didn't mind spilling the beans that he was returning. 6.) 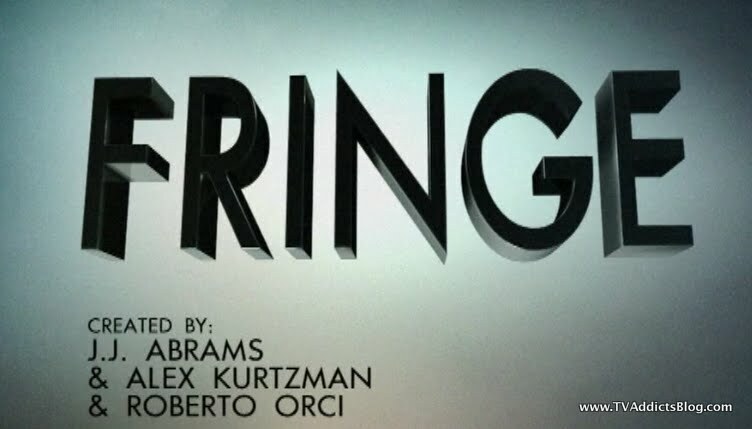 I think we have to remember that first and foremost, Fringe is always going to have its CASE to solve within a 44 minute timeframe, minus commercials (in most episodes. 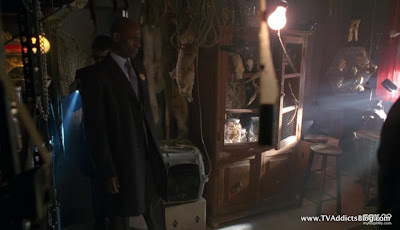 We do know there are 100% mythology episodes too) Even William Bell noted that the computer was running all of the parameters that Walter put into it to find a suitable replacement...so he/she wanted to help with the case. He seemed patient, so why shouldn't all of us too? I think ever scene they showed was important with advancing the story within the episode and within the long-term mythology. 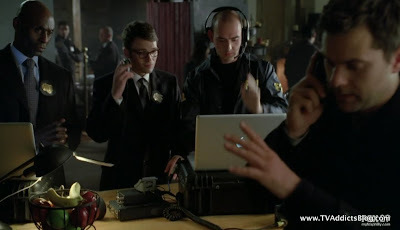 We did get a glimpse into Walter and William studying the results from the computer's search. We can probably assume that this analysis was longer than the 5 minutes we spent with them. 7.) Well Walter got his Bellie back, there's not much to whine about right now! But certainly he'll be whining again when he has to be willing to sacrifice his "son" for something! 8.) Sounds good...I'll keep DUNE in mind when we're the only 2 people watching next Fridy! lol I know I didn't watch live last week but those ratings are downright scary!! 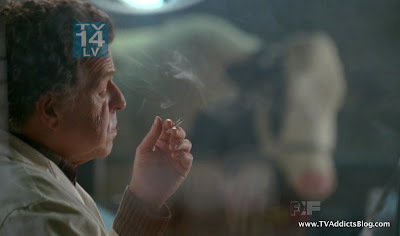 I really hope FOX understands the predicament they have put FRINGE in by putting it on Fridays. I've heard, maybe it was from you even, that Fox is looking at the DVR+7 numbers. Given the demos of the audience for this show, Fox can't expect a huge viewership on Friday night consistently. There's a lot of things going on for the networks right now. NFL in limbo, NBA soon to be and so will MLB. I've seen where CBS wants Sheen back--you think--LOL--he's their number 1 money maker. All of that to say, air time will need to be filled and with $4 billion the networks may not have to pay the NFL, there could be some shows saved. I don't want to come across as saying Ana's not doing a good job. She is doing a great job. It's just that after a while in certain situations like when she met Lee with that deep man's voice--it hit me as funny. Did anyone have questions about Lee being a good guy in future eps? Good point with NFL...but I don't think we'll be seeing Fringe air between 1pm and 7pm on a Sunday! lol I wouldn't object to it but they definitely wouldn't get the entire NFL audience to tune into that! I'm confused about your last question. I don't think Lincoln Lee has ever been considered a "BAD" guy. He was part of the team opposing our main "OVER HERE" characters in the season 2 finale, but since then we've grown to know the OVER THERE team and know that they're not really bad people. Well, I'm probably looking at it too much. 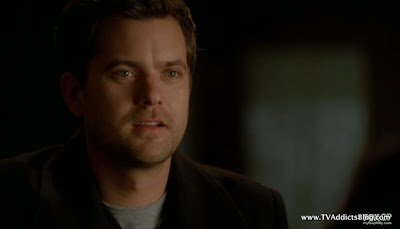 But, at the end when Lee(FBI Hartford agent)said his goodbyes, I just got the feeling that something wasn't right. Beyond the part of him being involved with Walter and crew in the future. And maybe I missed something, but when Peter stepped into correct Bellie(Olivia) about Fringe Division during their intro--Lee didn't seem bothered by the identification of a Fringe Division. I don't know, maybe I'm just imagining it. I for sure wouldn't give this any credence except that I've come to respect these actors. Lincoln actually said..."the WHAT division??" He had never heard of it before. So, I read some "slight" spoilery stuff on Ask Ausiello yesterday about the titles of the final 2 episodes. I will reveal the titles after a big spoiler warning. What i will reveal to all is that I did read that the last 3 episodes this season are tied together so they act almost like a 3 part finale (even though they will all air on separate weeks). That probably means 2 more myth-alone episodes this season then we're full on mythology! Okay...here come the episode titles! For anyone who wasn't on twitter tonight the producers tweeted that fringe got a full 22 episode pickup for season 4. Twitter has blown up intoassive celebration! Just thought I'd share the news!! Intoassive???? Lol crazy iPhone correction! That is "into massive" !! I told you there are many mysteries with this show. I think Sam is probably one of those guys who's always been around, or almost. It has been stated a couple of times that the machine can create as well as destroy. Maybe I chose my words incorrectly. I certainly was not trying to open up a debate to how Fringe does not have mysteries. As, I mentioned in The Event comments, it's just a different type of speculation than that of LOST. For starters, less viewers, means less people trying to figure out what it's all about. But with LOST, every sentence uttered provided cause for speculation. Fringe is not that kind of show. They answer questions within an episode or within a few episodes. There are some long-standing questions which they will get to eventually and pay off for the dedicated viewer. But, for the most part, I think I have covered the big questions on this blog. Especially...what's going to happen when that machine is activated? Most people assume it will destroy...I have referenced many times the fact that that it's been said on the show that CREATION is a possibility too. (as you just stated as well) So I'm leaning towards a result that is going to blow our minds more than just one universe gets destroyed. As I have mentioned before, this machine had to be used previously....and perhaps when it was used (by the First People maybe? ), maybe it caused the existence of these 2 universes!?! There's definitely stuff to speculate about. But you're not going to get 10 page diatribes about how people have figured out what the island is and what is going on on the show full of mysteries. That is my only point, and I stand by it. And STILL excited the show got renewed for season 4!